One of the greatest challenges in writing any story is figuring out where it begins and where it ends—most writers know that all too well. What seems like the obvious beginning may not be, and the tidy ending might end up having to come unraveled in order to make the story hang together. In life, there are lots of beginnings and endings that weave together seamlessly. So seamlessly, that sometimes we don’t even recognize them for what they are until we can look back and gain some perspective. These beginnings and endings are part of the natural rhythm of life. But there’s nothing natural about writing a novel. A novelist has to manipulate her main character’s life to find a beginning point that pulls a reader in and keeps her turning the pages. That beginning must lead to creating a character arc with believable events, crises, resolutions, and fundamental truths in the service of a satisfying ending. Basically, she has to make some sense out of life, which seldom follows a sensible trajectory. For instance, I first thought my WIP’s beginning should be when my historical main character very dramatically breaks free from an abusive father. But after slogging through a first draft, I realized she needed a more fundamental starting point. She needed something that balanced that crisis point with a nugget she could hang onto, a life-preserver, to help her make sense of everything and keep moving forward. I needed to give her omething that gave a shape to the events of her life and the person she becomes. Both of those beginnings—the first scene of the novel and the point at which the action starts—inform everything she does in her life. They determine her good and bad decisions, her relationships, her triumphs and tragedies. If I’m successful, the resulting account will offer a glimpse into her character that resonates with readers and makes sense of the contradictory person she was. I’ll never know if my interpretation of her life bears any resemblance to reality. I can’t climb into her head and find out what was going on there. I’m prepared to face the doubters who may think I’ve made too free with filling in the gaps and drawing conclusions. But that doesn’t matter in the end. 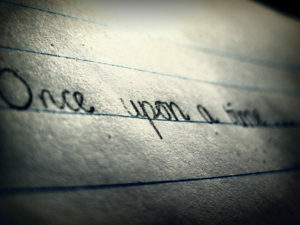 In the end, only the story matters. Because that’s what people read. Check out my other musings about writing historical fiction!